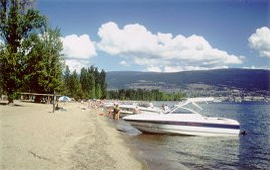 The park provides outstanding beach, waterplay and picnic opportunities as well as fantastic views down Okanagan Lake. For your convenience, during the summer season this park has a concession managed by the Park Operator. Old growth cottonwood is rapidly disappearing in the Okanagan Valley. The remnant protected in the park is important. Trails along Trout Creek access the edges of the old growth. Further development is not planned as it could be detrimental to forest health and public safety. 3 km south of Summerland off Hwy 97. Conservation: A small portion of rare old growth cottonwood riparian habitat adjacent to Trout Creek is protected. The cottonwoods and associated wetland thickets provide food and shelter for a variety of birds, insects and small mammals. Bird seen in the area include the Northern oriole, warbling vireos and the blue-listed Lewis’s woodpecker. The park also conserves 558m of shoreline and 100m of Okanagan Lake foreshore. Approved Purpose Statement and Zoning Plan [PDF 104.6KB] for Sun-Oka Beach Provincial Park is now available online in pdf format. Paddle boats are available on site for public rental. For more information, please contact the Park Operator. Pets/domestic animals must be on a leash at all times and are not allowed in the main beach areas or park buildings. There is a separate pet beach around the point to the east of the main beach. It is accessed by a 200m trail through the edge of the old growth cottonwoods. The pebbly beach extends east to where Trout Creek enters the lake. The dog beach does not continue across Trout Creek. Dogs are not permitted on the beach on the north side of the creek. Access is also possible from a trail along Trout Creek. There are no facilities at the dog beach though it is still busy with local dog owners. There is no overnight mooring, no fires on the beach and no swim buoys are in place to designate a swimming area. You are responsible for your pet’s behaviour and must dispose of their excrement. Backcountry areas are not suitable for dogs or other pets due to wildlife issues and the potential for problems with bears. There are snorkelling opportunities at the beach. The large, south facing bay at Sun Oka is great for swimming. The sandy lake bottom makes getting in and out of the water easy. The large area is marked with swim buoys. Use caution when swimming near the buoys since there are often many motorboats and jet skis in the area. There are no lifeguards on duty at provincial parks. The designated boating beach is a great spot to start waterskiing from. Campfires are permitted in the designated fire pits. Bring your own firewood. To preserve vegetation and ground cover, please don’t gather firewood from the area around your campsite or elsewhere in the park. Dead wood is an important habitat element for many plants and animals and it adds organic matter to the soil. You can conserve firewood and air quality by keeping your campfire small. Limited burning hours or campfire bans may be implemented and some parks may use communal fire rings. Be prepared to bring a portable stove for cooking. The park uses water from a well. There are taps in the change building as well two fountains beside it and another on the beach to the east. Another tap is on the beach to the west. This park has a group picnic site just off the eastern parking lot. It consists of 10 picnic tables in a large circle. They are on cement pads which, in turn, are on gravel. There is a central fire ring and also a tap. The area is away from the beach, shaded by trees and backed by thick shrubs. This park has a wonderful day-use/picnic area, with some 90 picnic tables and 500m of fine sand beach, that is very popular with area residents. There are five adjoining parking lots for 200 cars separated by irrigated lawn and large shade trees to keep most vehicles from getting to hot while parked. There is a separate parking area for trailers and RVs. A short (30m) walk along paved access leads from the parking area to the cement toilet/change building and concession and then to the beach. A 3m strip of pavement surrounds the 380 square metre building which is separated from the beach by a stone retaining wall complete with juniper bushes in planters at either end. A set of eight concrete stairs leads down to the beach from either end of the building. There are two benches on a small strip of lawn in front of the building and a phone on the west side. A metre and a half wide paved path parallels the beach to the west of the building for roughly 150m. It accesses the beach and a strip of picnic tables. The tables on the beach are set on cement pads and shaded by Ponderosa pine trees while the tables on the lawn on the other side of the path are shaded by deciduous trees. The beach is very popular with boaters and a large section of it has been designated for their use: from roughly 100m along the path to the western end of the beach is for boaters only. There are picnic tables, two fire rings and a volleyball net in this area. Ski boats are reminded to enter and exit the beach in a clockwise direction. No anchors within 100m of the beach due to the water intake pipe; boats can beach. A similar paved path parallels the beach to the east of the change building for roughly 120m. There are more tables on the beach on this side. These tables are less shaded with fewer Ponderosa pine trees present. Some of the tables have BBQ attachments and there are two fire rings. The lawn area on this side is smaller and blends into shrubs and forest. There are five very shaded tables in the shrubs with no lake view. Two pit toilets, one of them the wheelchair accessible toilet mentioned above, are located by the adventure playground to the west of the change building and beyond that in the area designated for boaters. Flush toilets are located in the change building. Pit toilet use only after September 30th (or sooner due to weather conditions). The park has a playground with a engineered soft fall base surrounded by grass. It is located just off the beach on the western side of the change building. This playground contains a slide, monkey bars and other exciting playground climbing features. It is designed for ages 5 – 12. There is a bench at the playground for use by parents supervising their children. The bench looks south past the beach towards the lake. There are four wheelchair accessible picnic tables and one wheel chair accessible pit toilet in the park. The change building is also wheelchair accessible.